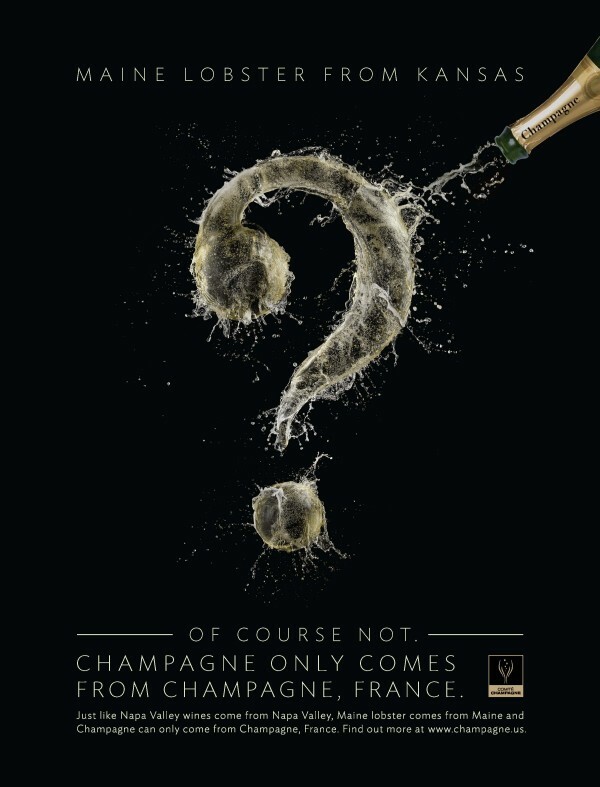 Maine Lobster Promotion Council teamed up with The Champagne Bureau to produce this ad, which has appeared this winter in several national magazines, billboards in major U.S. cities, and major media websites. A bill submitted to the Legislature would raise significantly more money for the state's lobster branding efforts. ELLSWORTH, Maine — A proposal to significantly increase annual funding for Maine’s efforts to market its signature seafood is set to get an initial review from state legislators this week. The goal is to raise $3 million for promoting Maine lobster around the world — roughly 10 times the annual amount that the Maine Lobster Promotion Council typically has used. The bill, LD 486, also would restructure the council’s board, giving licensed commercial lobstermen a larger proportion of seats. The Legislature’s Marine Resources Committee is expected to hold a public hearing on the bill at 9 a.m., Wednesday, March 6, in room 206 of the Cross Building in the State Capitol complex in Augusta. Maine Department of Marine Resources has solicited feedback from fishermen, lobster dealers and processors about LD 486, which would raise funds by increasing the annual surcharges that they pay for their licenses. Currently, those surcharges range from more than $30 to $250, depending on what kind of license it is. If the bill is approved, the surcharges would stay the same for 2013 but would increase in steps over the next several years. Surcharges for 2014 would range from more than $93 to $1,000, and by 2016 would range between $240 and $2,600, with processors facing the highest surcharges. Despite rising catches in recent years, Maine’s lobster industry has struggled with global economic downturn. Maine’s 5,000 or so licensed commercial lobstermen on average earned more than $4 per pound for their catch in the mid-2000s but have seen that average drop since then. Last summer, the price at one point hit a low of less than $2 per pound after an unseasonal glut of soft-shell lobsters created a supply that proved difficult for the North American lobster distribution network to absorb. The low price led to turmoil in the industry, with some fishermen threatening not to fish until the price improved and a blockade by Canadian fishermen of lower-priced lobster imports from Maine. Given the upheaval, most industry leaders seem to have acknowledged that more money needs to be spent to promote Maine lobster. Other states spend far more promoting their seafood products than Maine does, they have said, and Maine needs to step up its efforts. Patrick Keliher, commissioner of Maine Department of Marine Resources, said last week at the Maine Fishermen’s Forum in Rockport that there is strong support in the industry to do something. “There’s no guarantee in life [but] if we do nothing, we know it won’t work,” he said. David Cousens, president of Maine Lobstermen’s Association, said Saturday that it is “extremely important” to increase Maine’s annual lobster marketing funds. He said consumers need to be made aware of the robust state of the Gulf of Maine lobster population and the role that lobstermen play in helping to protect that resource. Aside from beefing up marketing efforts, he added, there’s not much Maine can do in the immediate future to improve the prevailing economics of the industry. Marianne Lacroix, acting executive director of the Maine Lobster Promotion Council, said Saturday that a new executive director will be appointed if and when the Legislature passes the promotion funding and reorganization bill into law. She said that the council has not been idle since the previous executive director, Dane Somers, abruptly resigned last fall. The council has partnered with The Champagne Bureau, a champagne marketing organization, to produce advertisements this winter that indicate lobster is a delicacy that is best when it comes from Maine. According to Lacroix, one such ad was published this winter in the New Yorker, Esquire, Food & Wine, Travel + Leisure magazines, on billboards in American cities on the East and West coasts, and online on the New York Times, Politico, Vanity Fair, GQ and Wall Street Journal websites. The same ad is going to run again in the same publications this spring, according to Lacroix. She said that the council will continue to try to increase national and global demand for Maine lobster, whether it gets more funding or not.